As the large and the influential exhibition in the horticultural and floricultural area all around the world, the 18th Hortiflorexpo IPM Beijing has been successfully held from 11-13 May, 2016 in China International Exhibition Center (New Venue). The fair is organized by China Flower Association and managed by China Great Wall International Exhibition Co., Ltd (odd-numbered year) and Intex Shanghai Co., Ltd.(even-number year). Also, Messe Essen GmbH, a professional German exhibition Company, is the international co-organizer of fair. The 18th Hortiflorexpo IPM Beijing has gathered nearly 679 Chinese and foreign exhibitors from about 31 countries and regions. 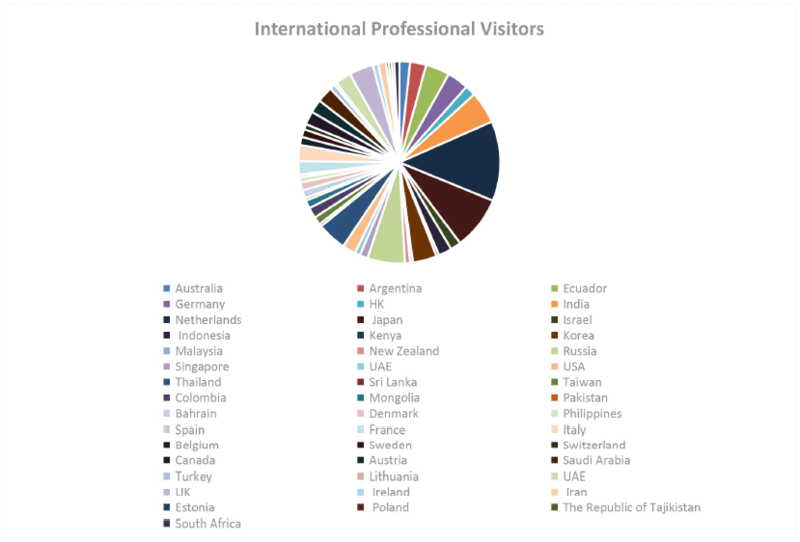 Also, during the 3 days, there are more than 28937 professional visitors from 46 countries and regions coming to the fair. Among that, there are 24196 professional visitors, with the 40415 person-time. Moreover, a series of New Product Press Conference, Technology Exchange Meeting, Home Gardening Forum, Large-scale Floral Performance, etc. have been held to improve the fair’s professionalism and interest. The final report will be stated in the three aspects: The Scale of the Fair and the Data of exhibitors, Highlights of the Fair and Featured Events as follows. The 18th Hortiflorexpo IPM Beijing has improved a lot in many aspects compared with 16th Hortiflorexpo IPM Beijing and 17th Hortiflorexpo IPM Shanghai. This year, the display area of the 18th Hortiflorexpo IPM Beijing has reached over 30000sqm, a breakthrough in terms of scale, which is unprecedented in the history of the show.The whole Hall W1, W2 and half of W3 of in China International Exhibition Center (New Venue) are used for the fair. The number of exhibitors is 679, which increases 42.1% compared with that in 2014.The amount of international exhibitors is 189, increasing 42.1% than that in 2014. Among that, Netherlands Pavilion consist of 28 companies, covering an area of 192 sqm. German Pavilion contains 13 companies and covered an area of 192 sqm. After several years, Colombia Pavilion join the fair again with 26 participants, occupying a area of 198 sqm. Also, Taiwan Pavilion, French Pavilion and Ecuador Pavilion continue to participate in the fair with their special products , showing the countries and regions characteristics, reflecting the fair’s internationalism and persity. There are a series of concurrent event in the fair, totally 15 of Flower Arrangement, Forum, New Product Release Meeting, etc and 9 Static Display Platform. “Large-sized Flower Arrangement Performance” attracted a large amount of audience for the whole 3 days. It is a great platform for audience to communicate with the performer who comes from Germany,Spain, the USA, Japan, China Mainland and Taiwan. “Ohara Static Works Exhibition”,“Ikenobo Static Works Exhibition”,“YiHuaDao Static Works Exhibition”,all show their unique style and arise people’s interest. More than that, the “Combined Bonsai Works Exhibition”,“Concurrent Flower Arrangement Works Display” and “Young Florists’ Works 2016 Exhibition ” are all very wonderful. At the same time, the variety of Forum and Technical Seminar also leave the audience a deep impression, such as “New technologies and New Products of Vertical Greening Forum”, “The Fifth Modern Garden Forum and The Second New Varieties of Garden Plants Exchange Meeting”, “New Product Release of Linyi O.lvy Agriculture Comprehensive Development Co., Ltd.” “Combined Bonsai Works Exchange Meeting” etc. It is very useful for the industrial communication and technical innovation. Although, it exists some challenges for the exhibition, such as the location, transportation, and the date, the organizers fully use the Internet technology and thinking to improve effect of the fair. One of the typical operation is the “The Annual Flower Queen”, The Most Popular Exhibit on Wechat.The voting last 1 month and collect millions of voting, tens of millions of attention. It helps exhibitors to show their newest products and also, attracting a lot of visitors to come to fair.